I can’t believe it! We hit the last stop of our tour. While on one hand, the trip has been absolutely incredible and surpassed what I ever could have imagined, but it is still bittersweet that is has moved so fast. After packing up in Nashville, we immediately began the drive to our stop in Long Island. After about an hour, we stopped to get gas and also bought food for dinner at McDonalds. We really had no time to spend getting food. My mom and sister are both vegetarians, so they ordered cheeseburgers without the burgers, like a grilled cheese. The women taking the order was taken aback, but put into the system a cheeseburger sans burger. However, the order still baffled the people making the food so they got their grilled cheeses with a burger. Eventually, the order was corrected, but we all had a good laugh over this. It can be hard to be a vegetarian on the road! We stayed at a hotel in Abingdon, Virginia for the night. Of course, we did not arrive until the middle of the night. Immediately, we all flopped into bed, excited for a small break before finishing our journey in Long Island. The next day, bright and early we woke up and ate breakfast. As we drove, all of us were mesmerized by the beauty that we drove through! Virginia, West Virginia, and Pennsylvania have many beautiful spots. We stopped at a rest area and got a cute picture of Tilly in front of the West Virginia sign. The drive was pretty uneventful. Although at a rest stop for dinner, there was a Subway restaurant. I got pretty excited about the prospect of taking footage in the rest area, but was told by the manager that this was not allowed. Oops. We hit the road again, and had a pretty intense drive getting to Farmingdale because truck/trailers like ours are not allowed on parkways, only expressways. It makes directions extremely difficult, even with GPS. We did make it though! We all flopped into bed once again, and were excited to start our final stop the following morning. 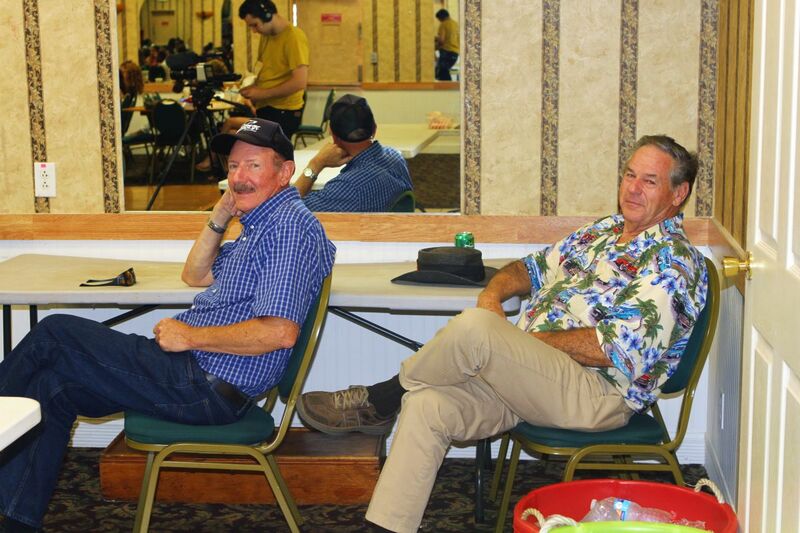 In Long Island, we held our event at the Knights of Columbus Center. 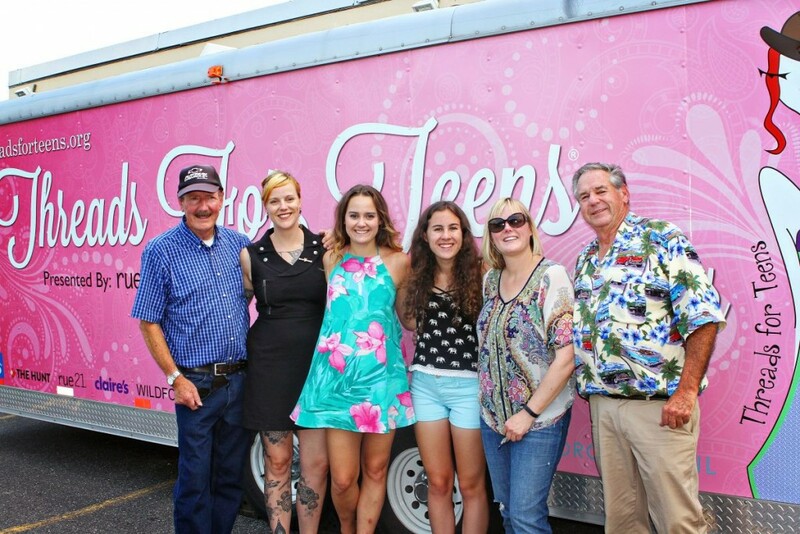 What made this day truly special was that Lori Kobayashi, Nicole Nejak, and Deanna Tomaselli from rue21 flew in from Pittsburgh for the stop!! How amazing is that!?! All three of them were excited to see Threads for Teens in action after hearing many good things from all of the different #RUECREWs across the country. My mom and I looked forward to meeting them, especially since we talked to them on the phone a lot in preparation for the tour. When we drove into the parking lot, already volunteers eagerly waited to set-up for the day. I have to say, one of the most amazing parts of the tour was knowing that when we arrived at a stop, we would be greeted with tons of smiling faces. Another AMAZING surprise?! Rachel Weinberger, a junior at the University of Delaware also came to the event. I spoke at the University of Delaware in the spring with an event put on by The Hunt and LF. 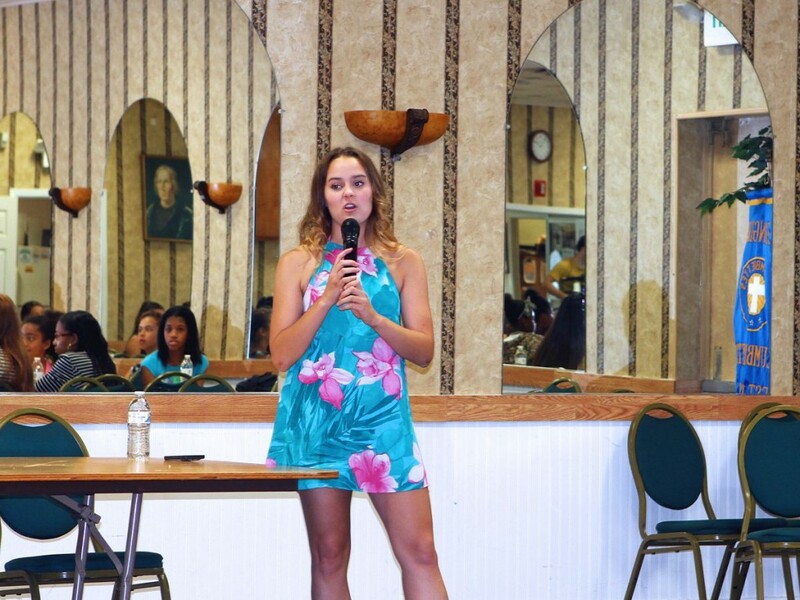 After speaking, Rachel became inspired to start her own fashion line called, “Vintage Revive.” She contacted me several months ago and asked for advice on how to start. Of course I said yes! 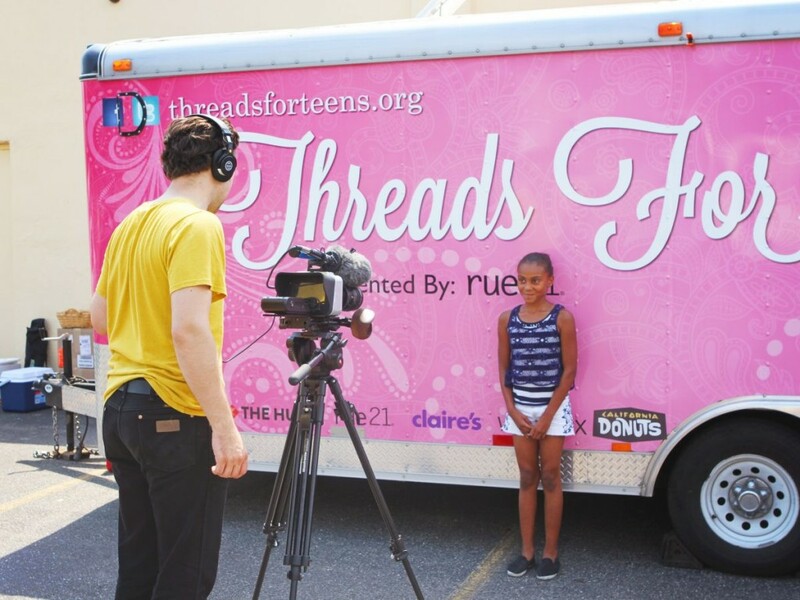 If anyone ever wants advice on anything related to starting a service project, make sure to contact me (Allyson@threadsforteens.org)! Anyway, Rachel came and set-up a table with tons of cute goods that she gave to the girls who came to shop for the day. 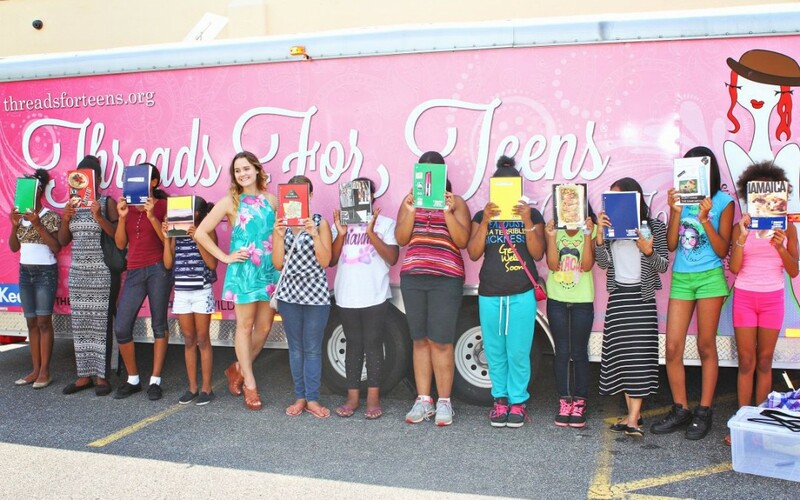 Literally, Rachel is a #GIRLBOSS and has an amazing heart. <3 Thank you Rachel for coming!! Our panelists for the day included Deanna Tomaselli, Bridget Bahl, and Kitty Joe Sainte-Marie. I mentioned Deanna above, she works for rue21 as the Media Relations Manager. 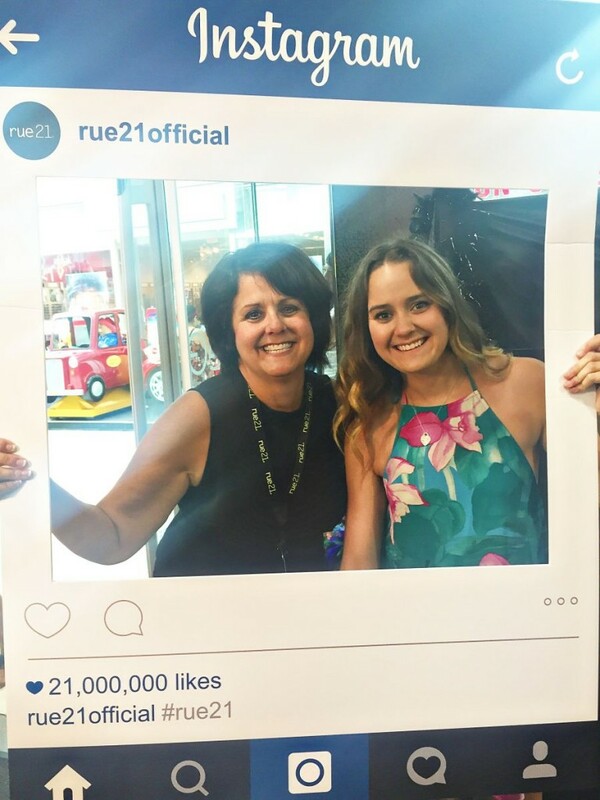 She was a big part of how our partnership with rue21 came to be in effect. Bridget Bahl curates editorial content for her fashion/lifestyle blog AndIWasLike.com. Bridget and I actually happened to be wearing the same dress at the Long Island stop, but in different prints. What a coincidence, but I definitely felt stylish after that! Lastly, my Auntie Kitty came out from Brooklyn to be a part of the event. She manages projects for an artist named Duke Riley. They do the most insane projects in countries like Cuba and China! Girls definitely got a big treat, hearing all of these amazing women speak. After this, we split the girls into groups for the different stations. We all definitely felt the sweltering rays of the sun, but no one complained. 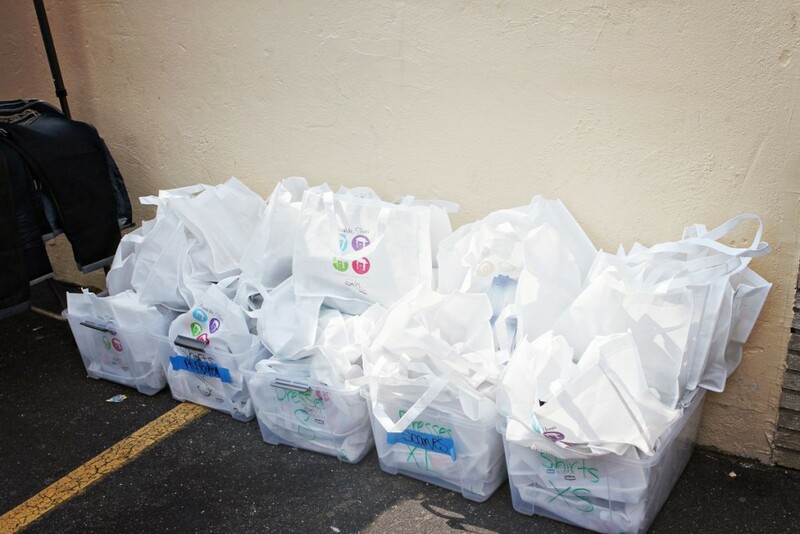 Many girls received clothing and could not believe everything they could take. Bridget brought several of her stylish friends to help style as well. Definitely a fun and amazing experience. 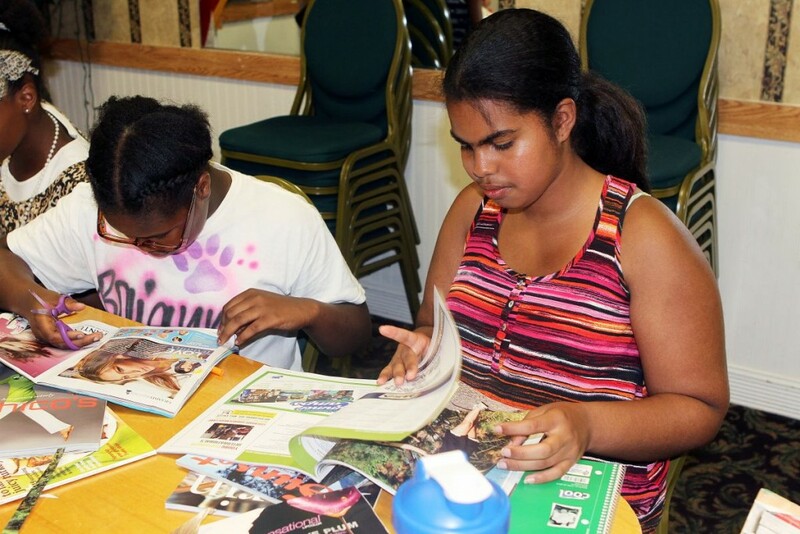 Inside the hall, Christine Segal came out to lead the vision board workshop. 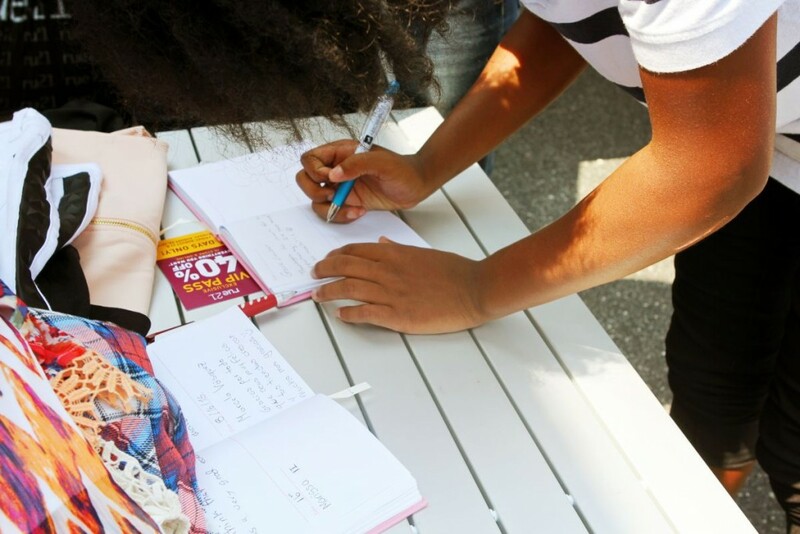 The girls all made really cute books. Also, as a fun way to switch up the workshops, Aleida Usher of Loft led a workshop on how to dress for a job interview, work, etc. Several years ago I was chosen as an ANNPower Vital Voices Fellow and went on a free trip to Washington D.C. for amazing girl empowerment training. 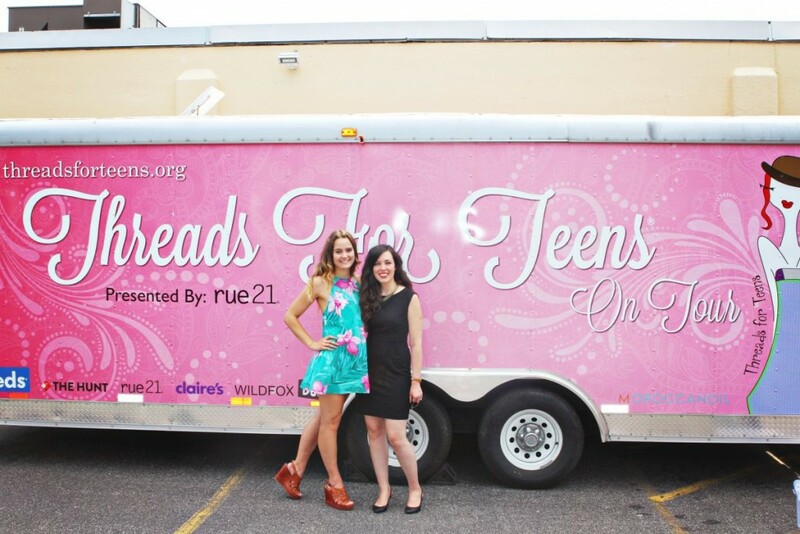 Since then, both Vital Voices and Ann Taylor both support Threads for Teens greatly. Last November, they sent a group of ten of us to London FOR FREE to attend the Trust Women’s Conference. A life-changing experience that I am extremely grateful to have had. Sadly, the day soon finished. I could not believe that what we had been planning for months was over, but it finished amazingly well! Everyone helped to pack up, and no joke it started POURING RAINING within seconds of packing up. The timing worked in our favor! But our day did not end then. 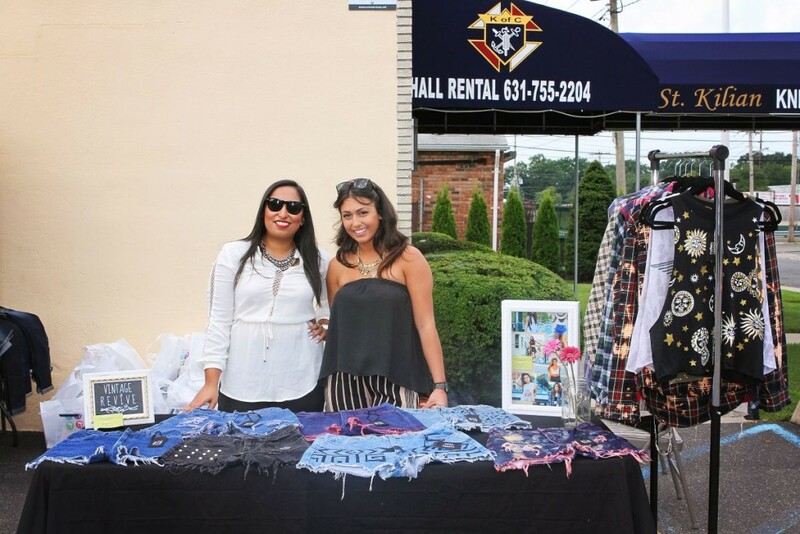 rue21 organized a wrap-up party at their Long Island Bayshore location. There was a DJ, donations for TFT, and contests throughout the day! 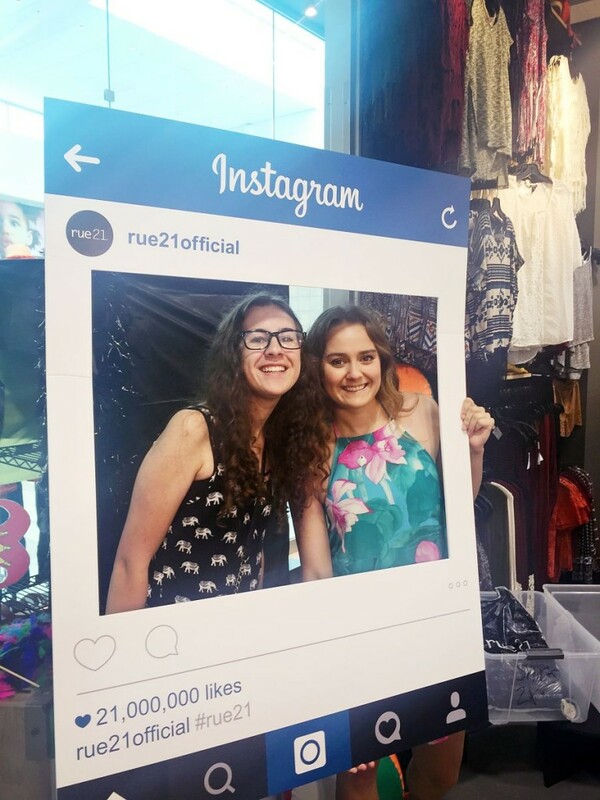 We cannot believe rue21’s generosity. ONCE AGAIN, THANK YOU rue21!!! At this point, extremely exhausted, we hopped in an Uber and drove to the airport. None of us (my mom, sister, or me) could believe that the tour was over, but we all high-fived each other in disbelief/happiness that we were able to pull it off.